On Saturday, August 12, violence erupted amongst skirmishes between protestors and counter-protesters gathered around the removal of a Robert E. Lee monument in Charlottesville, Virginia. With reports of the brutality and responsive protests unfolding, the complexity of the event is quickly being packaged by the mainstream media in a way that advances the Democratic political establishment’s ongoing effort to discredit President Donald Trump using false and inflammatory media narratives that exploit America’s systemic and troubling racism for political gain. The events in Charlottesville took place days after an earth-shattering Disobedient Media report broke into the mainstream, unequivocally and finally debunking the baseless Clinton-Obama argument that it was Russian hackers who interfered in the 2016 American election, and not the American Democratic Party itself. Though Americans blocked the efforts of the Clinton campaign, Obama administration, Democratic Party, and mainstream media to install Clinton as Obama’s successor last November, holdovers from the Clinton-Obama alliance continue exerting any political power they have to advance the interests of the American oligarchy and its rogue shadow government — or “Deep State” — flailing desperately to unseat Trump. The debunking of the Clinton-Obama “Russiagate” myth followed a call from the House Judiciary Committee to appoint a special counsel to investigate Clinton, Obama, and their network of co-conspirators in the FBI, DOJ, and mainstream media for their wrongdoing in the 2016 election and its aftermath. Massive court victories by Judicial Watch calling for emails from Clinton’s aides around the 2012 Benghazi attack, and others pertaining to the handling of the infamous “Comey memos” the DOJ failed to turn over following former Director James Comey’s departure, have party leadership in a state of utter paralysis as various scandals unfold and the party descends into free-fall. Context to understanding the state of American society in 2017 is the brutal recency of The Great Fleecing. After the working class’s political power was decimated by the wholesale export of good-paying American manufacturing jobs around the 2008 economic crisis, Americans have been left at the mercy of the United States’ rogue banks. What Obama orchestrated prior to his departure amounts to the greatest transfer of wealth in the history of the world: $4.5 trillion dollars was gifted to Wall Street banks, widening the gap between rich and poor more than under any president before. With a smile on his way out the door, Obama quietly left the vast majority of Americans in worse economic conditions than they have ever seen in their lifetimes. While Obama and Hillary Clinton’s relationship fluctuated over time, their 2016 alliance with each other, the Party, and the mainstream media was effectuated to protect the mutual interest of each of these four “pillars” of the American power establishment. As Vermont Senator Bernie Sanders’ primary campaign fraudulently vacuumed money, time, and votes from millions of engaged citizens organizing to reject the Clinton-Obama agenda, Obama’s administration worked with Clinton’s campaign to seemingly do all they could to disenfranchise and impoverish what remained of the American working class and the progressive Americans that rejected their agenda. The savvy are aware of Virginia governor Terry McAuliffe’s involvement with the Clinton-Obama alliance. Prior to the election, McAuliffe drew fire for inviting a Chinese national who donated to both his campaign and the Clinton Foundation to a fundraiser in Clinton’s home; the corruption in plain sight is currently under investigation by the Justice Department. Since then, his $500,000 donation to the election campaign of the wife of an official at the FBI who helped oversee Clinton’s email investigation has McAuliffe under even more intense scrutiny. Mayor Mike Signer also flaunts a precarious affiliation with the Clinton-Obama network. Shortly after Trump’s inauguration, Signer famously — and now ominously — declared Charlottesville the “Capital of the Resistance”. Considering the emptiness of this sloganeering by the Democrats, his reasons for doing so appear misguided at best. Saturday morning, a “Unite the Right” demonstration was scheduled to occur in Charlottesville’s Emancipation Park. Having secured the appropriate permits to protest, officials in Charlottesville had committed to protecting the demonstrators’ right to protest, regardless of the hideous ideologies of white supremacy at the root of the event’s purpose or espoused by any of its attendees. While some arrived in street clothes, many came dressed and armed in ad-hoc riot gear similar to the protective gear used by Virginia State troopers and Charlottesville police on site, undoubtedly emboldened by the overt racism inflamed by the establishment in the run-up to Trump’s election. The intentions of the counter-protestors, however, may be even more concerning. A loose network of “Antifa” (anti-fascist) activist groups had coordinated heavily in advance to supply counter-protesters to confront any outward racism anticipated at the event. This network included efforts directed by the Progressive Change Campaign Committee (PCCC, BoldProgressives.org), a Soros-funded activist group, and other left-leaning groups, such as Standing Up For Racial Justice (SURJ) and Refuse Fascism. While organizing to reject the white supremacy entrenched in American society is an urgent priority, political organizations motivated to confront voters perceived as racist instead of confronting the policymakers that protect and enforce America’s racist system should call for both skepticism and scrutiny. That morning, as the “Unite the Right” rally proceeded, counter-protester groups arrived en masse with the intention of disruption. Eventually, barricades sanctioning the permitted protest area were removed, eliminating the oversight afforded to demonstrators legally permitted to protest, and allowing confrontations to escalate. Demonstrators were forced by police to disperse, and deliberately funneled through groups of agitated counter-protesters, leading them directly into the conflicts that ensued. With the police locked in an intentional retreat, violence broke out. As the brutality was allowed to escalate, Governor Terry McCauliffe declared a State of Emergency that would disperse the masses; as they did, a car plowed through a crowd near the city’s downtown, killing a 32-year-old woman. Overall, an estimated 34 people were injured; a later helicopter crash resulted in two additional casualties by the end of the day. In the aftermath of the Charlottesville clash, it is clear that Mayor Signer allowed local authorities to abstain from preventing the violence that escalated. It is also clear that Governor McAuliffe’s declaration of a State of Emergency allowed further escalations of violence. It was on both the watches of Signer and McAuilffe that 34 innocent Americans were injured, and 3 killed. This negligence utterly disgraceful, and completely unacceptable. The failures of Signer and McAuliffe here should be investigated as soon as possible, going all the way up the chain of command, and leaving no stone unturned. There is no valid reason an elected official would order a police force to “stand down” or for a Governor to support it; any elected official that would allow such preventable violence should lose their seat and be banned from public service. At a time when virtuous leadership is called for, Signer and McAuliffe showed none of it. Worse, what they did was show continued participation in the Clinton-Obama establishment in a tantrum state as Trump’s administration neuters the massively corrupt network they hoped to install to rule the free world. That the Charlottesville clash took place on Clinton crony McAuliffe’s home turf, at the “capital of the Resistance”, and inflamed by paid partisan agitators, is by no means a coincidence: it is a clear continuation of the Clinton-Obama war on the 99%. Americans must resolve with unity to address this. As the events unfolded in Charlottesville, there was almost more to observe in the media’s response to the events than in the events themselves. Having famously allotted Trump billions in free airtime leading up to the 2016 election, the American mainstream media’s intentions remain under heavy scrutiny in light of numerous revelations that have exposed its flagrant and unethical loyalty to the corrupt Democratic party establishment. The irony of the intolerance espoused by those denouncing intolerance will continue until the Democrats accept and address this blatant and discrediting hypocrisy. Americans tuned into the Democrats’ response to their 2016 failure have watched as the Clinton-Obama coalition has shamelessly transitioned their failed campaign operations into a network of astroturf groups that seek to continue to discredit Trump instead of meaningfully addressing the struggles of America’s working class that rejected the Democrats last November. Truthfully, the Party cannot address these economic struggles honestly since they deliberately worsened them. Their only to option to move forward remains elevating Trump as a straw-man to distract from their wrongdoing. Tweets from party operatives Neera Tanden and John Iadrola offer a clear look at how the American establishment is casting the Charlottesville clash in favor of the dethroned Obama-Clinton regime. In response to an odd Friday night rally featuring choreographed neo-Nazis bearing tiki torches identical to those of the Ukrainian coup Obama and Clinton supported in 2014, Tanden issued an ominous setup that seemingly sought to pre-empt observers from blaming the establishment for what was to come. It’s hard to find more clear of a tool of the corporate duopoly desperate to project than the insufferable Tanden. In her tweet, Tanden exposes the intent of the Clinton-Obama Pied Piper strategy clearly: in place of any substantive agenda, the goal is to divert attention away from crimes of a ruling class that continues to pillage the earth and humanity every day. There are two things Trump can't ever seem to criticize: white supremacy, and Vladimir Putin. Fortunately in light of the Disobedient Media report, the Democratic Party’s “muh Russia” excuse is officially null and void. Further, as included in the House Judiciary’s call for a second special counsel, an independent investigation will be conducted to investigate Clinton and Obama’s own inappropriate ties with the Russian government around the Uranium One deal, the Ukrainian coup, and favoritism within the FBI and DOJ. Following the Syrian cease-fire and the withdrawal of covert CIA operatives pushing for regime change, the Clinton-Obama network will finally answer to the millions of Americans exploited by their delinquent and insidious endeavors. In the aftermath of the clash, one thing is certain: Americans of all party affiliations should unite to denounce the failure of these elected officials to protect their citizens and allow such needless losses of life. 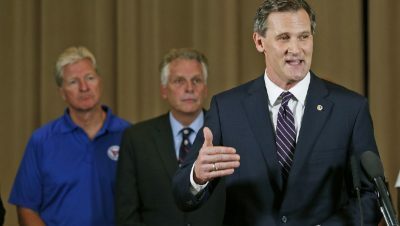 While the underlying dynamics of the demonstration deserve thoughtful analysis as America addresses its ongoing identity crisis, the malicious actions of Charlottesville Mayor Mike Signer and Virginia Governor Terry McAuliffe should be the cause for greatest concern. With blood on their hands and knee-deep in scandal, Mayor Signer and Governor McAuliffe should step down immediately and allow Americans to move forward in investigating Clinton and Obama without them. Until then, they will remain the faces of the most deadly cancer currently destroying American society. As overwhelming as it is to look the rotten American establishment in the eye, knowledge in the information age is more powerful than ever. While the corrupt establishment insists Americans should fight “right versus left” among themselves, the common sense of 300 million citizens suggests the American people are aware the most important battle is the one against a Deep State desperate to control them. The people who deserve the ire of the Americans are the oligarchs in the top 0.1% responsible for the expansion of poverty in America and unbridled militarism around the world. Americans by and large know this, and are gaining more ground than the Deep State. As intimidating as the Deep State’s war on Americans is, the American people are making progress. As complex as it may be to prioritize Americans’ interwoven struggles for economic and racial justice along with it, the American people should commit to making progress here too. As overwhelming as it may seem to confront America’s multiple oppressors, the American people should stay confident in their strength in numbers. As ugly as the road ahead may be, the fearless American spirit knows the only way out is through. Zach Haller zachhaller.com @zachhaller (Shirtless Pundit) is a writer, activist, and expert on the DNC Fraud Lawsuit. Support Zach’s work at patreon.com/zachhaller/ and by subscribing to The Zach Haller Affair, a YouTube channel by the people, for the people.